NB This cable is suitable for use with HW500D and HW700D series headsets ONLY ie HW510D, HW520D, HW530D, HW540D, HW710D, HW720D. If you do not have one of these 'D' model headsets just get the DA80. We shall not accept returns of the DA90 purchased in error. This cable is really clever! 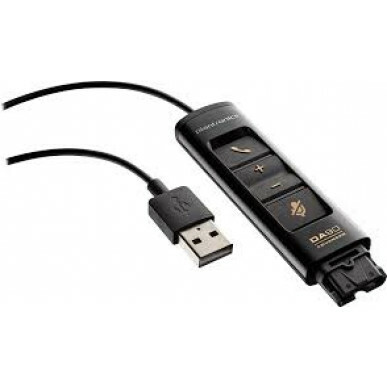 When used with Plantronics Manager Pro (available separately. Give us a call) and and HW500D or HW700D series headsets these cable effectively report back to base. Perfect for large rollouts where side by side (pligged in) call monitoring may be required. Manager Pro will update firmware en masse, can monitor usage and location of a headset and much more. IT department heads - LOVE this feature. It just makes inventory management a breeze. Plantronics DA90 USB to QD Adaptor with inline controls .